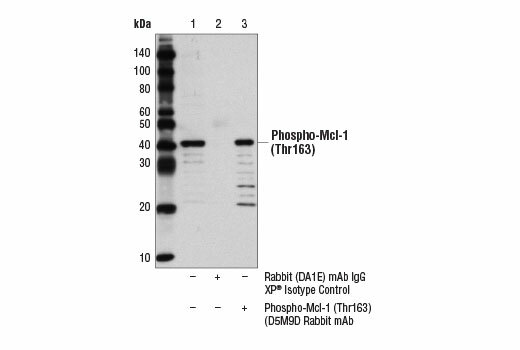 Phospho-Mcl-1 (Thr163) (D5M9D) Rabbit mAb recognizes endogenous levels of Mcl-1 protein only when phosphorylated at Thr163. 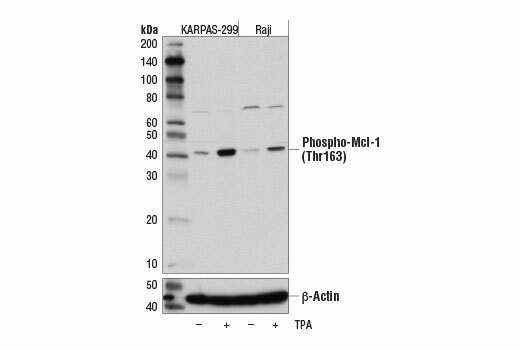 This antibody also cross-reacts with an unidentified protein of 70 kDa in some cell lines. Monoclonal antibody is produced by immunizing animals with a synthetic phosphopeptide corresponding to residues surrounding Thr163 of human Mcl-1 protein. Mcl-1 is an anti-apoptotic member of the Bcl-2 family originally isolated from the ML-1 human myeloid leukemia cell line during phorbol ester-induced differentiation along the monocyte/macrophage pathway (1). Similar to other Bcl-2 family members, Mcl-1 localizes to the mitochondria (2), interacts with and antagonizes pro-apoptotic Bcl-2 family members (3), and inhibits apoptosis induced by a number of cytotoxic stimuli (4). Mcl-1 differs from its other family members in its regulation at both the transcriptional and post-translational level. First, Mcl-1 has an extended amino-terminal PEST region, which is responsible for its relatively short half-life (1,2). Second, unlike other family members, Mcl-1 is rapidly transcribed via a PI3K/Akt dependent pathway, resulting in its increased expression during myeloid differentiation and cytokine stimulation (1,5-7). Mcl-1 is phosphorylated in response to treatment with phorbol ester, microtubule-damaging agents, oxidative stress, and cytokine withdrawal (8-11). Phosphorylation at Thr163, the conserved MAP kinase/ERK site located within the PEST region, slows Mcl-1 protein turnover (10) but may prime the GSK-3 mediated phosphorylation at Ser159 that leads to Mcl-1 destabilization (11). Mcl-1 deficiency in mice results in peri-implantation lethality (12). In addition, conditional disruption of the corresponding mcl-1 gene shows that Mcl-1 plays an important role in early lymphoid development and in the maintenance of mature lymphocytes (13). Kozopas, K.M. et al. (1993) Proc Natl Acad Sci USA 90, 3516-20. Yang, T. et al. (1995) J Cell Biol 128, 1173-84. Sato, T. et al. (1994) Proc Natl Acad Sci USA 91, 9238-42. Zhou, P. et al. (1997) Blood 89, 630-43. Wang, J.M. et al. (1999) Mol Cell Biol 19, 6195-206. Jourdan, M. et al. (2003) Oncogene 22, 2950-9. Chao, J.R. et al. (1998) Mol Cell Biol 18, 4883-98. Rinkenberger, J.L. et al. (2000) Genes Dev 14, 23-7. Opferman, J.T. et al. (2003) Nature 426, 671-6.